The pushrod and its role in the valvetrain is an often overlooked, yet vital piece in the puzzle of high performance. It is the translator of cam and lifter movement to the rocker arms and valves. Bridging the gap between the two, the pushrods are held responsible to deliver the exact orders of the camshaft without flex or deviation. 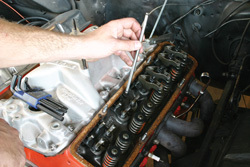 Most factory-style pushrods were constructed with a welded-on ball tip on each end of the rod. At the tip of the balls is a small hole used for oil transfer and lubrication to the where the pushrod meets the underside of the rocker arm. There have been numerous changes made by aftermarket companies to further improve on the design for specific applications. Although they are all basic in form, there are many facets to the selection of the right pushrod for any high performance motor. Let’s first take a look at valvetrain geometry and its effects on the function and performance of your engine. When installing a new set of rocker arms or pushrods, it is crucial to obtain the proper working geometry in the valvetrain to maximize your engine’s power potential and reliability. There must be ample clearances for all moving parts of the valvetrain. Keep your car scoring higher at the shows, without blowing the budget. 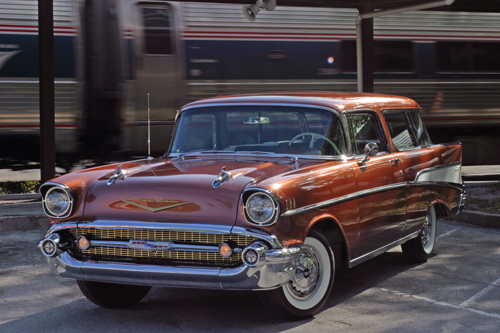 To prove the point, we’ve put together ten super cheap restoration tips that will make a big improvement in how your car looks and how it comes across to others. These are things that are frequently overlooked, and they’re guaranteed not to break the bank. So let’s walk through a few things that you can do at minimal cost, to make your car stand out in a crowd. Grab your cleaning supplies and a can of elbow grease, and let’s give the wallet the day off. We grab it, whack it, drum it, get it sweaty and some of us even pick at it when we are frustrated. We also subject it to blistering heat and frigid cold throughout its life cycle. It’s the first thing we see when we get in and the last thing we grab when we are getting out. We present to you: the steering wheel. This modified tiller takes a lot of guff from us drivers over the course of its life. The above mentioned scenarios are but a few of the ones we have seen and, well, if the truth be known, participated in. 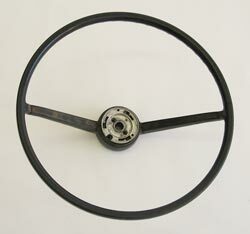 Obviously, there are reproduction steering wheels available for many brands nowadays, but there’s always “that one”– the model or year that’s just not available. In this “You Can Do It”, we’re here to show you how you can get your old, cracked steering wheel back into showroom shape.